On the 10th of October 1950 I resigned from the Navy and moved to Stockholm. I did not have much savings to speak of when I left the Navy, but I had received a stipend to support me until I got a civilian employment and this gave me the economical opportunity to get further education. And my intent was to enrol at the Naval Academy at the upcoming turn of the year. But meanwhile I needed a job in order to support myself. The unemployment-office directed me to a job as extra porter at the County Administrative Board of the County of Stockholm. This employment turned out to have a profound influence on my future, since the man who interviewed me for the job implied the possibility of a career at the County Administrative Board. I saw this as a great opportunity and abandoned my plans for the Naval Academy and a continued life at sea. This decision put me back to square one, since I was once again a beginner, just like seven years ago when I enlisted in the Navy. But there was a major difference; I now had matured, learned how to take on responsibility and make decisions. I also had been well trained in functioning as a supervisor. With time I got assignments with increasing responsibilities and after a couple of years I was appointed to office clerk. During the years of 1957 to 1958, I had the privileged opportunity made economically possible by the County Administrative Board to get an education to administrative officer. After completing this education I was assigned to handle driver's-licences, commercial traffic and traffic at sea. A year later I was appointed to an additional position with the function of assisting the public with for example guidance in writing applications. Later I also held a position vhere I, in addition to my regular duties, presented suggestions of improvements in our work- routines. 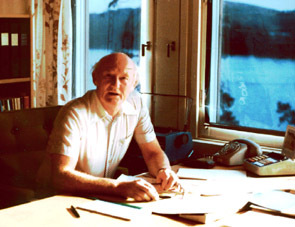 In January 1967 I was relieved of my regular assignments in order to participate in a committee with the task of joining the Governor General Office of the City of Stockholm and the County Administrative Board of the County of Stockholm into one government body. The merger took place in January 1968. On the new County Administrative Board, logically named the County Administrative Board of the County of Stockholm, I from this point onwards only handled questions of organisational nature. The County Administrative Boards have almost always been the subject of analysis and re-orginasations. During my time, the number of employees was cut to less than half. On the 1st of July 1971 there was yet another partial re-organisation of the County Administrative Boards. In connection to this, I was employed in the capacity as Senior Administrative Officer, at a newly initiated government body called the Central Agency of the County Administrative Boards(abbreviated in Swedish as LON). Here I participated in and often led many projects directly changing the organisations of the Boards. My assignments required numerous visits to the Boards across Sweden. In 1976, I was appointed by the minister heading what then was the ministry of municipalities, to act as secretary in a committee of inquiry into the organisation of the planning-sections and administrative units of the County Administrative Boards, among other matters. After this assignment, which lasted for just over two years, I returned to my regular position at LON, where I remained until my retirement in 1991. My work first at the County Administrative Board of Stockholm and later at LON with the personnel of the Boards across Sweden has been extremely stimulating and enriching. In the years following my appointment at the County Administrative Board, I devoted a large part of my spare time to raise my level of competence in topics that could be useful to me at the Board. In the evenings I attended various courses at the Commercial University of Stockholm and at the Commercial Institute of Stockholm. Simultaneously, I studied additional subjects via distance. I also resumed the driving-lessons that I had interrupted in Karlskrona in 1945. The driving-school was for some reason called Svea and was located nearby my home. The manager put on a crooked smile when I told him that I more or less was fully educated. I figured that I needed just a few more lessons. But, no! The manager was a grim man and demanded a review of the theoretical part, which cost extra, and quite a few driving-lessons before allowing me to take the test. But on the day of the driving-test I was lucky. The driving-test took place on Östermalm in Stockholm. I had been driving in many places in the city during my lessons, but never there. But everything went excellently. We returned to the starting point and I parked the car in the street in a slight downhill about a meter behind another car. This went well, the inspector said and stepped out of the car and went into the office. Light at heart, I too stepped out of the car and slammed the door shut. Then the stupid car started to slowly roll and came to a stop against the bumper of the car in front. I had not fastened the emergency brake. This was of course noted by the manager of the driving-school, who came up to me and hissed in my ear: "This time you were damned lucky!" I got my driver´s-license. Just before Christmas the same year I left the Navy, I married a girl named Kerstin who came from Roslagen, a part of the countryside north of Stockholm. We had been going out for a couple of years. We lived in a small apartment on Söder, the southern part of the inner city of Stockholm. Kerstin had the apartment when we met. Our daughter Monica was born and after a few years we tried to get a more roomy apartment. There was a shortage of apartments in Stockholm in the1950s.But we finally managed to get a bigger apartment in the same building under the condition that we took care of the repairs of the flat ourselves. And this was actually not just an ordinary touch up but rather a total renovation. The apartment had for many years been occupied by a recently deceased relative of the landlord. It was a bachelor, who according to the neighbours had been quite odd. We never met him, but we were told that he had been a writer who used to work at night and sleep during the day. When we gained access to the apartment we found, among other things, the traces of a phone in the hallway, a torn off cable and four holes in the wall. One of the neighbours told us, that the author had had problems with his phone. When the repairman one morning had rung on his door and asked to see the phone, the writer had ripped the phone off the wall and handed it to the repairman saying: "Here you go", and then closed the door. Anyhow, the landlord had the wood-burning stove removed and put in a new nice gas stove, replaced all radiators and so on. We paid for putting up wallpaper and painting. This was a big expense for us. Kerstin took care of our home and Monica and my income from the County Administrative Board was modest. But the rent was relatively low and the apartment turned out very nicely. Here we knew many fun and happy moments. We were one of the first families in the building to get a TV. As early as in 1956 we bought our first set. It was a Philips and imported directly from the Netherlands. It was a rather small but heavy machine with a 14 inch screen and an extremely sharp and good black and white picture. We got much pleasure out of this TV and so did some of our neighbours and Monica´s friends. We ended up living in this apartment for just over twenty years. It was not until the early 1970s that we moved to a bigger apartment in a newly built area in the same parish. But already in the late 1960s, before the move, the family got an additional member, who greatly influenced our continued lives for a number of years. It was a female springer spaniel called Mymlan, ten weeks old. Naturally she got spoiled. For her to lie in her own basket was unthinkable. No, she got her own armchair in our bedroom. This often meant an early waking, because if you turned and faced the room at day break, you inevitable received the first greeting of the day in the form of a wet dogs nose in your face. In the night, she sometimes snored violently. But this did not matter since Mymlan otherwise was such a positive contribution to our lives. From early on, Kerstin and Monica spent the summer months in the countryside in Roslagen and I went there over the weekends by train on Roslagsbanan. In the beginning we had access to a small cottage owned by my mother-in-law. It had an area of 15 square meters and consisted of a small kitchenette and a living room. When Kerstin started to work outside of home, we acquired a piece of land close to the cottage and built a country house. We devoted quite a bit of work and time into creating a rather sizeable vegetable-garden, which later on included a greenhouse. Almost all of our free time we from then on spent in this house both summer and winter. Kerstin worked in the public schools in Stockholm and was free during most of the summer and then I commuted to and from work. Immediately after the change from driving on the left to the right side of the road in 1967, we got our second car. It was a used SAAB with a two-cylinder engine running on oil-based gas. This make of car was known as the Jungle-drum because it made a pattering noise and emitted some smoke. But the car worked extremely well and had a great gas-mileage. It was one of the best and most cost-effective cars I have ever owned. Our first car deal I made in 1959.This deal really should be ignored in silence but there are reasons to mention it, since it caused me to wait almost eight years before getting another car. The car was a Morris Minor. It was shiny and great looking with leather interior. Unfortunately the engine was worn out. At best, you could reach a speed of 60 km per hour. The heating system never worked. We kept the car on a public parking place a couple of hundred meters from our home. One morning when I picked it up, the brakes did not work. It turned out that the brake-cables had been cut. On another occasion the police called us at home and informed us that our car apparently had been stolen. It had been hot-wired and was parked on a street in Bromma, a suburb north of Stockholm. The police advised us to go and pick it up. We went there and finally managed to start the rickety old thing. In order to park it, I shifted to a high gear and then quickly released the clutch. From the towing-company that I engaged to remove the hot-wiring, I learned that this car model was extremely easy to hot-wire. You simply moved one of the fuses one step. This took ten seconds. When winter was approaching, we de-registered the car and kept it at a farm in the countryside. At the inspection required before re-registering in the spring, the inspector found that the body had to be reinforced in a couple of places before the car was safe to drive. This turned out to be a costly repair. In the fall I managed, although suffering a substantial economical loss, to sell the car. In order to benefit the garden and since I always have liked honey, I decided to get honey-bees. After taking a course in how to keep honey-bees, I was ready to become a bee-keeper. A bee-hive was acquired and put up by the country-house. My first bee-colony I bought through an advertisement in the Bee-keepers Magazine. I picked it up at an intersection a couple of Swedish miles outside of Uppsala. It cost 300 Swedish crowns and was delivered in a box with a sealed wooden bottom and a screen on top. The queen had had her wings cut and was marked with that year's color which was white. The seller claimed that she was very light in color. I got a certificate from him and then he put the box in my car and disappeared. As it turned out, the queen was not light in color at all ,but dark. The bees were extremely angry. Despite boots, jeans and a long-sleeved sweater underneath the bee suit, I got stung a lot. The bees hunted me through the bushes in the garden. Even when I was inside the greenhouse they kept me under observation and attacked me when I stepped out. 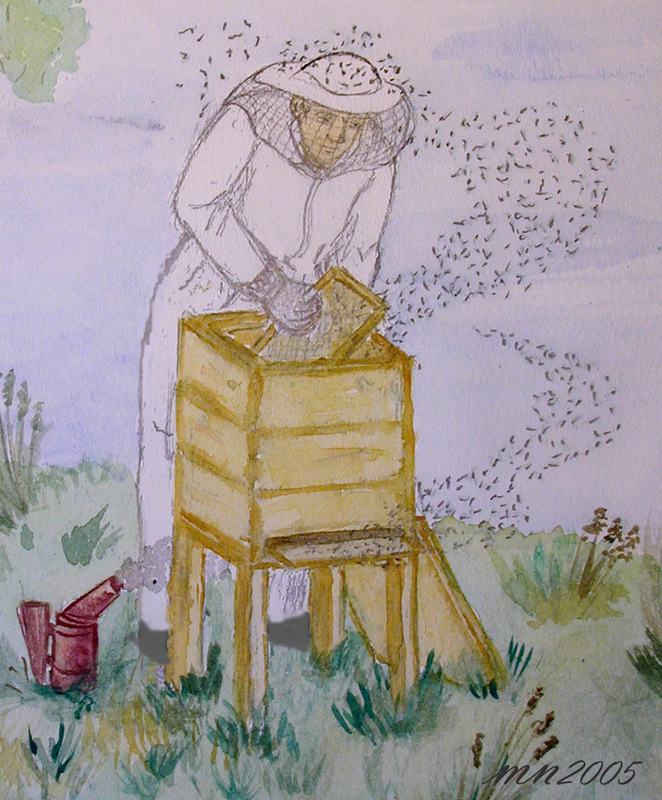 The other family members were forced to stay inside when I had been working with the hive. The neighbour's cats, who used to visit us every day, had earlier accessed our garden where I had placed the bee-hive. The cats nowadays walked a long way around when they came to visit us. There was nothing less than a state of war on our property. The bees swarmed three times. Despite everything, I managed to squeeze out fifteen kilos of honey from the colony. The next year I bought, as soon as possible, my first buckfast-queen, who I with some trouble managed to introduce into the angry colony. It was a great feeling when I in the fall was going to prepare the colony for the winter. There were no bees flying out when I lifted the top boards and the ones crawling up on the side panels I could easily push down into the hive with my bare hands. At its best, this colony produced 110 kilos of honey during one season. My political interest was awakened when I met Kerstin. Her father was a social democrat and the chairman of the local municipal executive board. Through the years I voted for the social democratic party, but it was not until the 1980s that I got actively involved in politics. I was asked to run as representative for the party in the parish of Högalid in the election of the parochial assembly of persons who manage the affairs of the parish. I was not particularly interested in matters of the church, but since I was going to be the last entry on the ballot, number 23, I agreed. There is no risk of me being elected, I thought. But this was a misjudgement on my part. The party did badly in the national election but extremely well in the parochial election and I was elected. It turned out that the assignments were interesting. For many years I then was a member of both the assembly and its executive body, the parochial church board. I was also appointed honorary secretary in a foundation and in a recreational-house association belonging to the church. The church of the parish of Högalid is very beautifully situated in the west of Södermalm. This is the only church in Stockholm with two towers, built in 1917 to 1923 after the design of Ivar Tengbom. Högalid is a large parish. It has about 30,000 residents, two large hospitals and three units of full-service housing for the elderly. In this majestic building our daughter Monica was confirmed. 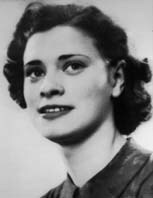 She later got her college-diploma from Södra Latin. She got a B.Sc. in chemistry and biology at the Universities of Stockholm and Lund. After this she began her graduate studies in biochemistry at the Karolinska Institute in Stockholm. In 1978 she emigrated to Canada and continued her graduate-education at the McGill University in Montréal. Her studies led up to a Ph.D. thesis in biochemistry, "DNA synthesis in Polyoma Virus", which she presented at the Karolinska Institute in 1981 during a short visit to Sweden. In 1984 she returned for good to Sweden and Högalid. Nowadays she lives in Roslagen near by our country house. In July of 1993 my wife passed away. Since 1995 I cohabit with Ulla-Britt, who lost her husband in 1991.We are living in Haninge, just south of Stockholm. Designat av Kjell Närkhammar i oktober 2004.